One of my favourite breads is olive bread. I have lots of recipes on my blog but this time I made it quite different. Now that we are fasting, it’s perfect for any time of the day, for breakfast, as a snack but also in the evening I don’t like eating cooked food, so a slice or two of olive bread and a cup of tea is perfect for my dinner. Last autumn, after we settled down in Assini, we started planting some vegetables in our back yard, such as onions, garlic, artichokes, broad beans, peas, mint, coriander, fennel, dill, rosemary, Kafkalithres, Tordylium Apulum or small hartwort and Myronia (chervil), which are two of my favourite herbs. To see what I made with some of these vegetables, you can read the post on my other blog. Yesterday I cooked some broad beans and was thinking of making Ladenia for dinner but last minute I changed my mind as I still had some green onions, garlic and mint I had picked earlier in the day. With the mint I made a pesto. As I had decided to make the olive bread, I had the olives pitted, the mint washed and leaves drying and the green onions and garlic, finely chopped. In this recipe I used green olives but you can make it was other types of olives as well, the best being “throumbes”. Put the onions and garlic in a food processor with some of the olive oil and mix. Start adding as much mint leaves in the food processor with more olive oil and mix so that the volume of the mint will decrease and repeat adding mint and olive oil. With the last batch add salt, pepper and vinegar and remaining olive oil and mix. Leftover can be stored in the refrigerator for a week. For a longer period, store in the deep freezer. For the dough only 500 grams flour is necessary but I made the dough with 1 kilo flour and 50 grams fresh yeast. 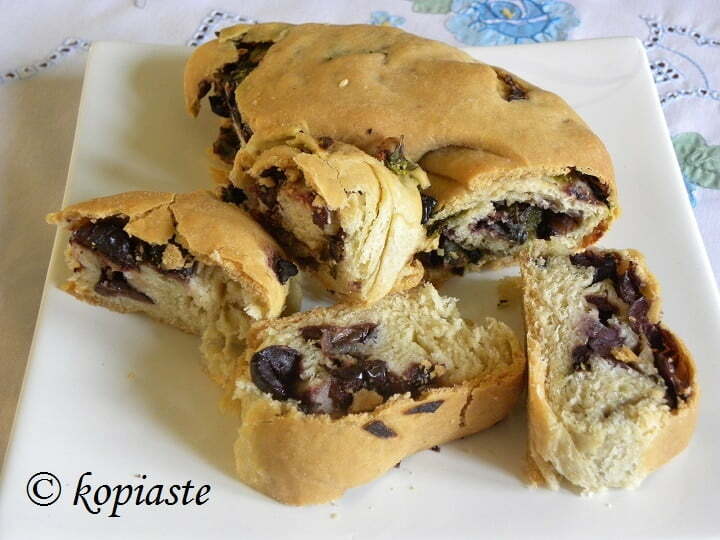 I used half of it for the Olive Bread and with the remaining I made another bread with a sweet filling. The second bread was made the same way but the filling was made using half cup tahini and 1/2 cup mandarin marmalade which I mixed to incorporate well and then spread the filling on top of the dough. I baked both of them in the same baking tin. Prepare dough and set aside until it doubles in volume. Grease a baking tin with olive oil. Put the dough a press it with your fingers towards all directions until it is about 1 cm thick. Spread the pesto on the dough. Add the olives, spring onions and fresh garlic and mix. Roll th dough to enclose the filling. Preheat oven to 200oC / 400o F and bake for half an hour (fan forced) or according to your oven. Throumbes (θρούμπες) is a variety of Greek black olives, which mature on the tree. They are the only olives which can be eaten directly from the tree when they are ripe and they are rather wrinkled. These olives are often cured in salt. With these olives we tradionally make eliopita in Cyprus. These olives are never used to make olive oil. Top left, throumbes olives, on the right, top and bottom green olives. Green olives are also cracked and then sold. Bottom left, Kalamata olives. I have another Eliopsomo I made last Easter but never published it. The procedure is almost the same as above but the dough is kneaded with fresh orange juice, instead of water. 1000 grams bread or all purpose flour with 50 grams fresh yeast, 1 tsp sugar, 1/4 cup olive oil, 1/2 tsp salt, 200 ml orange juice and water if necessary. Divided in the middle and half was used to make Eliopsomo and the second was used to make a mandarin – tahini bread. Dough is made and rolled as above. All the filling ingredients are mixed together. The bread was baked in a round baking tin. The bread was brushed with olive oil and some sesame seeds were sprinkled on top. Both version look and sound amazing! Bread looks mindblowing, love that pesto. Yum! I love bread and would definitely love some of yours…looks delicious and so tasty. wow! what a filling! With that I mean both the breads. I am quite sure to make the olive one soon. I have tried your olive and feta filled rolls you had posted a couple of months back and they turned out great, as always I had to tweak here and there a little but those are going to become a part of our familxy recipe now as I’d be making them often enough. Thank you!!!! !